Within a suburban context of complexity of form and materials the palette for this beach house was kept deliberately muted and limited. The emphasis of the sculptural enclosure was on protecting and revealing the functional nodes of the dwelling. 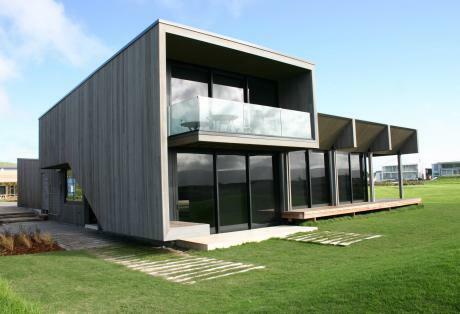 The form controls and celebrates the environmental conditions and is arranged around the rituals of New Zealand beach front living. The house is designed to be self contained amid a cluttered suburban backdrop with outlooks carefully limited to focus on the beach and adjoining reserve. Detailing focused on the Pacific rim tradition of timber framed construction, using the same material, cedar, in a variety of methodologies, to produce different qualities of space, opacity and transparency.